Unwind Wednesdays is a big hit! 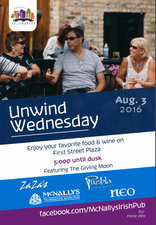 Organizers, sponsors and attendees of the first ever Unwind Wednesday event held on July 6th in downtown St. Charles at the First Street Plaza are all in agreement that it was a big hit. “For 6 years we envisioned having an event like this in which patrons can buy their drink of choice at separate restaurants and walk out and enjoy them on the plaza. We were quite pleased by the turnout and comments from attendees and everyone involved.” We are greatly looking forward to the next one on August 3rd“…Shay Clarke, Head Organizer and General Manager of McNally’s Irish Pub. I was excited to attend the first “Unwind Wednesday” event. I knew it would be a success. Music brings people together and I'd say that we need that more now a days. The fact that we had the freedom to order what we wanted from all supporting establishments was the icing on the cake. I was also impressed how security was present to see that everything was in order and I saw some faces I haven't seen in a long time! Great event!! My husband and I will be at the next "Unwind Wednesday" on August 3rd, can't wait to see what band will be there next!...Shawn Campbell, St. Charles resident. The UnWind Wednesday that took place on July 6th in the First Street Plaza was a fun, engaging and very beneficial event for the businesses on First Street and the surrounding areas. I heard nothing but positive comments from businesses as well as attendees of the event. The jazz group that played from 5:00 – 7:00 (Rogue Jazz) were awesome too and I think everyone really enjoyed the evening! I’m looking forward to the next event on August 3rd!...Laura Macklin-Purdy, Business Development, St. Charles Chamber of Commerce.